Researchers have taken on the problem of reducing a super computer the size of a basketball field to that of a book. The answer is "biocomputers" – incredibly powerful machines capable of performing multiple calculations with a fraction of energy. According to study coordinator Heiner Linke, who heads nanoscience at Lund University in Sweden, "a biocomputer requires less than one percent of the energy an electronic transistor needs to carry out one calculation step." A biocomputer is useful because ordinary computers are incapable of solving combinational problems, such as those dealing with cryptography or other tasks requiring that a multitude of possible solutions be considered before deciding on the optimal one. These already exist, but the new research from Lund tackles the key problems of scalability and energy efficiency. On Jan. 25, 2016, California's Office of Environmental Health Hazard Assessment (OEHHA) released a final regulation introducing a New Section 2 into the Safe Drinking Water and Toxic Enforcement Act of 1986 (Prop 65) regulations. The new section 2 gives OEHHA the authority to develop a website to provide information regarding chemical exposure from Prop 65 listed chemicals to the public. The regulations require OEHHA to populate the website with information on how consumers can be exposed to chemicals, information on how to reduce exposures to chemicals, links to other regulatory bodies, and any other public information OEHHA determines is relevant. The regulations also give OEHHA the authority to mandate that chemical manufacturers, selling products containing Prop 65 chemicals, provide information to be posted on the website. OEHHA can request a variety of exposure related information, including: location of the chemical, the chemical concentration, and an estimated level of exposure. The regulations do not require manufacturers to conduct testing and manufacturers are only required to provide information that is reasonably available. Importantly, the website regulations are not required under Section 6 – Clear and Reasonable Warnings and therefore are cannot be enforced under the civil penalty provisions of Prop 65. Prop 65 prohibits a person in the course of doing business from knowingly or intentionally exposing any individual to a chemical known to the state of California to cause cancer or reproductive toxicity without first giving "clear and reasonable" warning to the individual. The Center for Disease Control and Prevention (CDC) issued a joint report titled, "Possible Health Implications from Exposure to Formaldehyde Emitted from Laminate Flooring Samples Tested by the Consumer Product Safety Commission." The Consumer Product Safety Commission (CPSC) testing indicated excessive levels of formaldehyde from laminated wood flooring manufactured in China; and the CDC and Agency for Toxic Substances and Disease Registry (ATSDR) evaluated possible health effects from formaldehyde released into indoor air from this laminate flooring. On March 1, 2015, 60 Minutes reported that Lumber Liquidators®, was selling a Chinese-produced laminate wood flooring product that released high levels of formaldehyde. 60 Minutes tested formaldehyde levels in 31 boxes of commercially available laminate flooring products purchased from Lumber Liquidator® stores in five states (Florida, Illinois, New York, Texas, and Virginia). 60 Minutes reported that some test results were higher than the California Air Resources Board (CARB) emission standards. Because of concerns raised by the 60 Minutes report, CPSC conducted an in-depth test of laminate flooring samples manufactured in China during 2012-2014 that were sold at Lumber Liquidators® stores. CPSC subsequently requested that CDC/ATSDR evaluate the test results for possible health effects. In general, the report did not raise a cancer concern; it did, however, conclude that exposure to formaldehyde in the CPSC-tested laminate flooring sold at Lumber Liquidators® could cause irritation and breathing problems in children, older adults, and in people with asthma or other breathing problems. In addition to the possibility that CPSC may take further action, the U.S. Environmental Protection Agency will be releasing a composite wood rulemaking, similar to the CARB composite wood rule that regulates the formaldehyde emissions from composite wood. Sad goodbye to, Ralph McCall of @WasteCap Thanks Ralph!!! WasteCap is saying goodbye to one of ours. Ralph McCall is retiring and it is a sad goodbye. Ralph has been with WasteCap since day one. He has weathered every storm. He has innovated. He has succeeded. If there is one thing that is indisputable it is that WasteCap would not be what it is today without him. It would be much less. We wish every person could have the opportunity to hear Ralph talk about his time with WasteCap. The stories he can share from first walking on job sites and working with Project Managers telling them about this idea of "recycling" on a construction project. Hearing how he was told to get off the job site. Or how this idea would be dead within a month. "It takes too much time and room!" Well, Ralph was persistent. Ralph taught what WasteCap to this day preaches. You can save money, time and make a safer job site through recycling. Over the years, we have recycled 693,713 tons of material. We have worked on projects with over $5 billion budgets. We have saved more than an estimated $27 million through recycling, and that is just on half of our projects. That is the legacy of Ralph McCall. He changed perceptions. He helped Wisconsin. He helped our environment. Ralph was also a mentor. He did not hold back. He made sure that you did the right things the right way. If he saw potential he made sure it was realized. While WasteCap will continue doing great work. We will have to do it without one of the best people and a great friend. Every end is a new beginning. Ralph now can enjoy time with the people and in places he loves. He can enjoy time with his family and being in the outdoors. This goodbye started WasteCap on a new journey. As you can see in the photo below, we redesigned and painted a salvaged church pew as a going away present. This is something we are going to be doing more on in the future. We will be refinishing, re-crafting and re-imagining furniture. Keep an eye out for these products coming soon to our Salvage Warehouse. Or if you have a specific want let us know and we can create it! So Ralph even in his retirement created a new path for WasteCap. Instead of goodbye we say thank you and onward! President Obama has released his budget for fiscal year 2017. The president's spending and revenue proposals will be mainly dead on arrival on Capitol Hill, including his $3 trillion in proposed tax hikes. So it is more interesting to look at the budget baseline, which presents projections assuming no changes in law going forward. Since Obama's proposals will go nowhere in Congress, the baseline gives us a better picture of what the next president will face when he or she comes into office next year. Under the baseline, fast-growing spending inflates the deficit from $616 billion this year to $1.4 trillion by 2026. 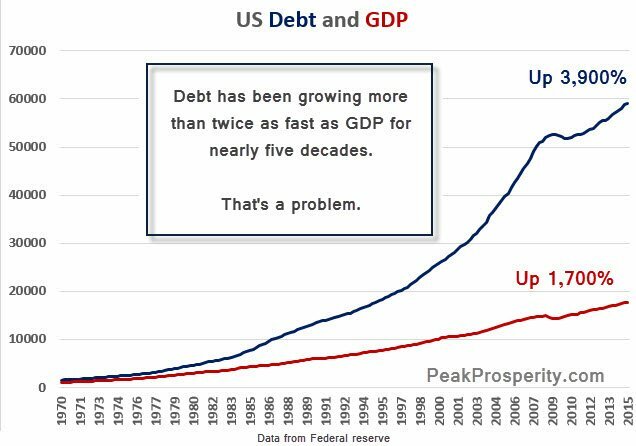 As the deficits accumulate, federal debt held by the public will soar from $14 trillion this year to about $24 trillion by 2026. If you stacked $24 trillion in $100 bills in a pile, it would stretch 16,000 miles high, or about the height of 150,000 Washington Monuments. Government debt—driven by deficit spending—is by far Washington's largest monument. ...Our diagnosis of the fatal flaw facing the global economy and its financial systems has remained unchanged since before 2008. We can sum it up with these three simple words: Too much debt. All but the most blinkered can rapidly work out the fallacy captured in the above chart. Sooner or later, borrowing at a faster rate than income growth was going to end because it has to. Again, it's just math. 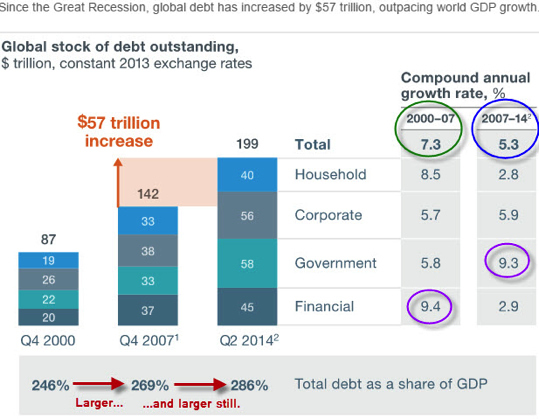 Math that our central planners seem blind to, by the way -- all of whom embrace "More debt!" as a solution, not a problem. DoubleLine Capital's Jeffrey Gundlach said it's "frightening" to see major financial stockstrading at prices below their financial crisis levels. 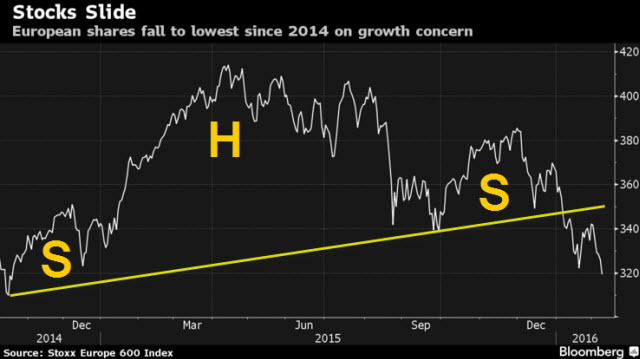 "We see the price of major financial stocks, particularly in Europe, which are truly frightening," Gundlach said. "Do you know that Credit Suisse, which is a powerhouse bank, their stock price is lower than it was in the depths of the financial crisis in 2009? Do you know that Deutsche Bank is at a lower price today than it was in 2009 when we were talking about the potential implosion of the entire global banking system?" 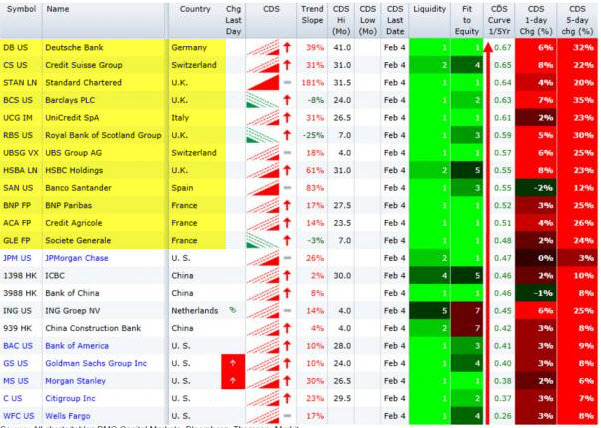 This time it looks like the trouble is likely to begin in Europe, where we've been tracking the woes of Deutsche Bank (DB) for a while. But in Italy, banks are carrying 18% non-performing loans and an additional double digit percentage of 'marginally performing' or impaired loans. Taken together, these loans represent more than 20% of Italy's GDP, which is hugely problematic. More than 5.5 million people worldwide are dying prematurely every year as a result of air pollution, according to new research. World War II was the deadliest military conflict in history in absolute terms of total dead. Over 60 million people were killed. The 5.5 million premature deaths from air pollution means over 60 million die prematurely every 11 years. Allowing global air pollution to continue at current levels is like allowing a world war to continue uncontested against the global population and economy. There is also additional economic costs in the trillions. Airborne pollution doesn't necessarily (or even often) stay in the country of origin. About one third of China's air pollution is carried to other countries like Japan and even crosses over to North America. China's (in particular) prodigious output of airborne nano-pollution is the chief factor which has lead to Arctic ice-cover loss. Soot pollution (i.e. dark stuff) reduces albedo. Which necessarily increases solar absorption. Which deposits more joules to the surface. Which MELTS ice faster. This effect is currently estimated to be about as large as any carbon dioxide effect for overall global climate warming. This effect may be larger for ice melting. Sulfur Dioxide (smog) condenses in atmosphere (with help from ultraviolet) to sulfur trioxide aerosols. These bright white aerosols stay aloft for years, and act as a mutual reflective blanket: reflecting a small amount of sunlight outward (nominally cooling.) but retaining a higher fraction of infrared ground emissions (blanketing, warming), which impacts the outflow of infrared, which is what normally powers the consolidation of sea ice. Most of these deaths are occurring in the rapidly developing economies of China and India. The main culprit is the emission of small particles from power plants, factories, vehicle exhausts and from the burning of coal and wood. The data was compiled as part of the Global Burden of Disease project. "Air pollution is the fourth highest risk factor for death globally and by far the leading environmental risk factor for disease," said Michael Brauer, a professor at the University of British Columbia's School of Population and Public Health in Vancouver, Canada. "Reducing air pollution is an incredibly efficient way to improve the health of a population." Analysis shows that the two countries account for 55 per cent of the deaths caused by air pollution worldwide. 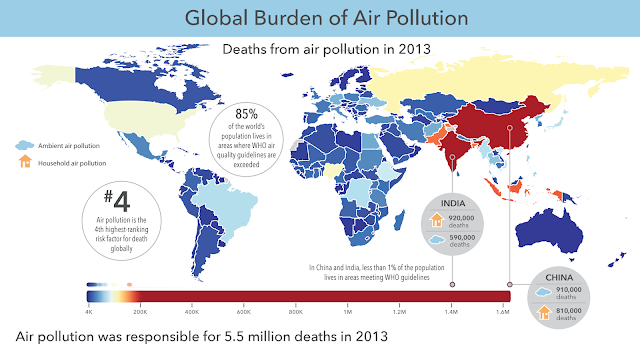 About 1.6 million people died of air pollution in China and 1.4 million died in India in 2013. The expected number of premature deaths in China in the future if the country meets its current targets to restrict coal combustion and emissions through a combination of energy policies and pollution controls. She found that air pollution will cause anywhere from 990,000 to 1.3 million premature deaths in 2030 unless even more ambitious targets are introduced. Boeing announced that it has installed a first-of-its-kind 50MW Solid Oxide Fuel Cell (SOFC) system on a naval base in Port Hueneme, Calif. The fuel cell system, which can scale to 400KW, is unique in that it uses solar power to generate hydrogen gas from seawater, which it then stores until power and it releases the gas into a fuel cell stack to produce electricity, heat and water. Because the system can both store energy and produce electricity, Boeing is calling the fuel cell system "reversible." The Navy's Engineering and Expeditionary Warfare Center is testing the fuel cell system on a microgrid to determine its viability for use at both remote bases and during overseas military missions. With the proposed connection between the Zika virus and Brazil's outbreak of microcephaly in new born babies looking increasingly tenuous, Latin American doctors are proposing another possible cause: Pyriproxyfen, a pesticide used in Brazil since 2014 to arrest the development of mosquito larvae in drinking water tanks. Might the 'cure' in fact be the poison? The World Health Organization view that the microcephaly outbreak in Brazil's impoverished northeast is caused by the Zika virus has, so far, received few challenges. Brazil's Health Minister, Marcelo Castro, has gone so far as to say that he has "100% certainty" that there is a link between Zika and microcephaly, a birth defect in which babies are born with small heads. The view is widely supported in the medical community worldwide, including by the US's influential Center for Disease Control. But there is no hard evidence of the link, rather a mixture of epidemiological indications and circumstantial evidence. The New York Times also reported on 3rd February on the outcome of analyses by Brazil's Health Ministry: "Of the cases examined so far, 404 have been confirmed as having microcephaly. Only 17 of them tested positive for the Zika virus. But the government and many researchers say that number may be largely irrelevant, because their tests would find the presence of the virus in only a tiny percentage of cases." And last weekend, the most powerful indicator yet that the microcephaly may have another cause altogether was announced by Colombia's president, Juan Manuel Santos, as reported by the Washington Post. Colombian public health officials, stated Santos, have so far diagnosed 3,177 pregnant women with the Zika virus- but in no case had microcephaly been observed in the foetus. President Barack Obama presented a budget to Congress on Tuesday that if enacted would add nearly $10 trillion to the national debt, according to the White House's projections. The president's final budget, widely considered to be dead on arrival due to the Republican-controlled Congress, projects the nation would face a $27.4 trillion debt in 2026. The budget set the actual total debt for 2015 at $18.1 trillion, projecting an increase of $9.3 trillion. When President Obama took office the debt stood at $10.6 trillion. Computerworld: The world's largest solar power plant, now live in Morocco, will eventually provide 1.1 million people with power and cut carbon emissions by 760,000 tons a year. Next Big Future: Canada has several projects for small modular nuclear reactors (SMRs) and very small modular nuclear reactors (VSMRs). VSMRs are typically of capacity below 15 MW while SMRs are usually up to 300 MW. Remote communities, mining and oil/gas production sites, and government facilities are the three most likely customers of remotely-deployed VSMRs. Canada has over 200,000 people in over 200 remote communities and 80% of energy comes from diesel powered generators, he said. "It's getting increasingly difficult year by year to bring [diesel] in," Humphries said. The ice roads of northern Canada are crucial supply routes for providing fuel and resources to remote communities and mining operations in the winter. The ice roads were late to freeze this winter and some reports suggested climate change was having an impact on the seasonal cycle. Other fuel transport measures include road train, special flights and ice breaker ships. "You're talking up to C$2/kWh [to supply electricity] in those regions," Humphries said. Many nuclear vendors are targeting initial Levelised Cost of Energy (LCOE) in the range of C$0.30-0.40/kWh with a long-term goal of reducing costs to a level that would compete economically with the cost of power in an urban area, Humphries added. 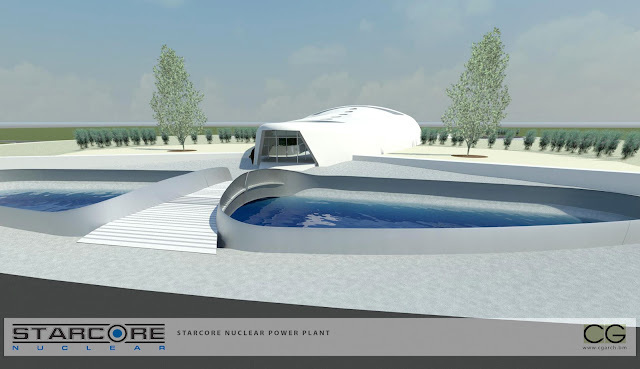 StarCore Nuclear is developing a 30 MWe high temperature gas nuclear reactor. It is safe, reliable and operated remotely. This makes it ideal for two types of frontier customers in Canada – mines and villages. These customers currently rely on diesel generation and propane, which are expensive and increasingly unreliable due to shrinking ice road capacity. Starcore has identified two dozen mines where they can offer electricity and heat at prices well below the mine's alternative cost and still be highly profitable. Villages are currently heavily subsidized by governments and utilities. For the larger villages, or those near mines, we can offer retail customers electricity at attractive prices, enable community development, substantially reduce the subsidies, and earn strong profits. Beyond Canada, there are 1.3 billion people worldwide who have no access to electricity, and another billion relying on expensive diesel generation. Using the experience gained in Canada, we will offer affordable electricity and clean water to customers in this huge market, significantly improving their living standards and health, while earning attractive profits. Gizmag: A bit of friendly competition never hurt anyone. China's EAST tokamak and Germany's Wendelstein 7-X aren't exactly fusion energy's answer to Messi and Ronaldo, but through their own flashes of individual brilliance the reactors might one day command the world's attention in a much more important way. Wendelstein 7-X made headlines last week after generating a quarter-of-a-second pulse of hydrogen plasma, and now scientists at China's Institute of Physical Science have flexed their fusion muscle to sustain the gas for an impressive 102 seconds. Pope Francis, Environmental Anthropologist...our responsibilities to each other and the natural world that we share. Abstract: In June 2015, after much anticipation and a few leaks, Pope Francis released his encyclical entitled "Laudato Si': On Care for Our Common Home." "Laudato si'" means "praise be to you," a phrase that appears repeatedly in Saint Francis' Canticle of the Sun poem. The encyclical itself has been widely praised and widely reported, far more than one would expect from an explicitly religious document. The encyclical is breathtakingly ambitious. Much of it is addressed to "every person living on this planet," while specific parts speak to Catholics and others to religious believers generally. It surveys a sweeping range of environmental and social problems. Along the way, it relies on anthropology, theology, science, economic, politics, law, and numerous other disciplines. Especially anthropology. The popular response often described Laudato Si' as a "climate change" encyclical. It's not: only five of the 180 pages specifically address climate change, about the same as the discussion of the noise and ugliness, crime, housing, and transportation that affect the "ecology of daily life." It is not really even an environmental encyclical, for the natural environment does not play the starring role. Rather, it is an encyclical about us. Francis contends that the natural environment suffers because we misunderstand humanity. This Article examines the encyclical from the perspective of Christian environmental thought more generally. It begins by outlining the development of such thought, and then it turns to the contributions of the encyclical with respect to environmental anthropology, environmental connectedness, environmental morality, and environmental governance. As the article explains, Pope Francis is a powerful advocate for a Christian environmental morality but a less convincing advocate for specific regulatory reforms. His greatest contribution is to encourage more people, religious believers and non-believers alike, to engage in a respectful dialogue about how we can better fulfill our responsibilities to each other and the natural world that we share. The BPA-free trend started after studies found a link between bisphenol A (BPA) and health issues such as early puberty and prostate cancers. After that, products with bisphenol S (BPS) started cropping up as a safer alternative. But now a UCLA-led study suggests that BPS can be just as harmful as BPA, causing faster embryonic development and disruption of the reproductive system in animals. On February 2, 2016, the United States and European Union Commission announced the EU-US Privacy Shield Agreement. The Agreement will govern regulation of data flows between the United States and the European Union (EU) and, as one of the EU Commissioners stated, the agreement addresses concerns by EU members regarding use of European citizens' data and personal information by U.S. companies and the U.S. government. The Agreement will impose strong requirements on U.S. companies with respect to the collection and use of personal data. The limitations and oversight requirements will also be imposed on collection and use of Europeans' personal information and data by the United States government. Aggrieved Europeans will have a number of affordable and accessible dispute resolution options. While awaiting the specifics of the Agreement, a consensus has emerged that companies might still be able to rely on the EU Model Clauses and Binding Corporate Rules for data transfers, but whether those protocols survive after the terms of the Agreement are released remains to be seen. Companies relying on the U.S. Safe Harbor provisions may face enforcement action since that scheme was invalidated by the Court of Justice of the European Union in the Schrems decision late last year. 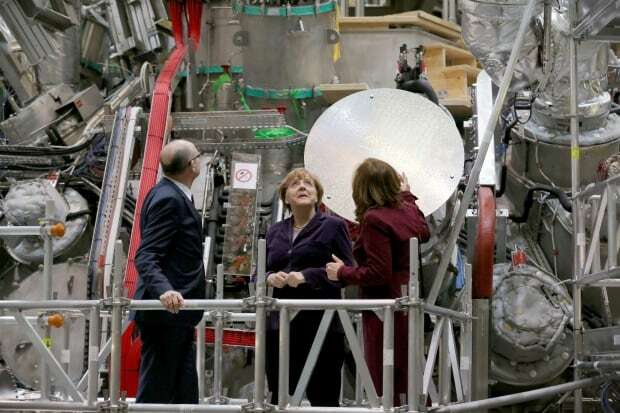 Scientists in Germany flipped the switch Wednesday on an experiment they hope will advance the quest for nuclear fusion, considered a clean and safe form of nuclear power. Skyrocking rates of antibiotic prescriptions now suggest that as many as four out of five Americans may be getting antibiotics annually, according to a new study by the Centers for Disease Control and Prevention. It's is concerning officials, especially because overuse is one reason antibiotics are losing their punch and making infections harder to treat. The report released Wednesday gives the first detailed look at usage of these medicines in every state and finds it highest in the South and Appalachia. West Virginia had the highest rates at 1.237 prescriptions per person, followed by Kentucky at 1.232 and Tennessee at 1.199. The lowest rates were found in California (0.6 per person), Oregon (0.595) and Alaska (0.529).